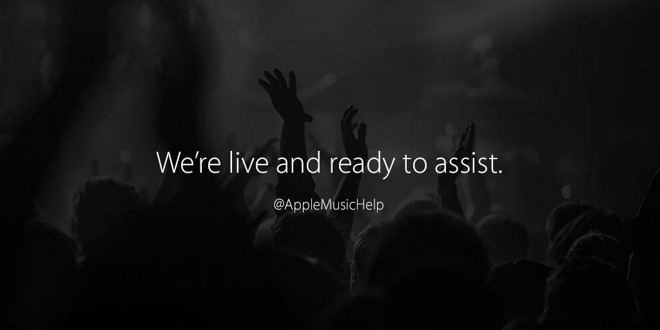 The official @AppleMusicHelp account went online on Wednesday, offering live assistance for Apple Music users during set hours. The account is advertised as active seven days a week, from 6 a.m. to 8 p.m. Pacific Time. Apple representatives controlling the account have thus far requested more details via Twitter direct message from users seeking assistance. The new account joins the official Beats by Dre Support presence on Twitter, which debuted in July. Though Apple has a number of specialized Twitter accounts, including a newly launched profile dedicated to App Store games, it still does not have a main @apple account. Chief Executive Tim Cook and other company executives are, however, on Twitter with personal accounts.